Widespread protests in Zimbabwe have been followed by a government crackdown in which police and military have beaten dozens of civilians, shot 12 people and arrested over 600 since January 14. While the military has claimed that those accused of assaulting or killing civilians are “imposters” taking advantage of the chaos, the Zimbabwe Human Rights Commission, a committee formed by the government, have reported findings in Harare and Bulawayo suggesting clear trends in police harassment and assaults against accused protestors as young as 11 years old. In an attempt to minimize the protests, the security minister blocked internet access across the country for much of last week which has yet to be fully restored as many social media applications remain cut off, despite opposition from the high court. These protests have arisen as a result of a 240% increase in the price of fuel following escalating costs of living, sustained unemployment and rampant inflation. While this has been the reason cited by many of those involved in protests and there are further strikes planned by teachers and other state workers, the government has continued to refer to this opposition as “terrorism.” The military as well as government officials have argued that the main opposition party, the Movement for Democratic Change, has used this turmoil as a means to destabilize the government which has been followed by further arrests of opposition legislators. This week brought a temporary end to the longest shutdown in US history. International Relations Editor Evelyne Goulet discusses the dynamics of the clash behind the shut-down and the devastating impact it has had on federal employees and the lives of everyday Americans. Speaker Nancy Pelosi has made it clear that she will not have a vote on legislation that includes a border wall, while President Trump argued for the importance of the wall during a televised address to the nation in early January. Ciprian Constantinescu makes the case for Maduro’s illegitimacy as a President and the need for regional and international intervention in Venezuela. While the rest of the world looks on, Venezuelan citizens flee the country by the millions, seeking protection from the violence and poverty caused by massive inflation. The time has come for the democratic community to adopt a more hawkish position and do their best to finally bring about the demise of one of the most catastrophic regimes since the fall of the Berlin wall. Julia Nguyen analyzes the unique brand of populism becoming widespread in Asia. With elections later this year in the Philippines, Thailand, India, and Indonesia, the world waits to see if the region will join the populist tide sweeping the rest of the globe. Unlike in Europe, populism in Asia is much less focused on economic decline and immigration. Instead, it is centred around issuessuch as countering crime, religious and ethnic divides, and appealing to a disgruntled middle class which is losing faith in their leaders’ ability to address inequality and the provision of social services. Zaheed Kara discusses the modern-day conception of state sovereignty. State officials have a duty to provide certain rights to the citizens of the state, and must be held accountable should they fail to do so. Thus, sovereignty is contingent on their capacity to provide for the people. Oscar Beghin examines the newest buzzword in the international trade regime: Slowbalization. The World Economic Forum’s annual conference brought together world leaders to discuss global trade strategy in the context of increasing domestic protectionism. In a nutshell, this term refers to a new era in global trade in which we now find ourselves where global trade seems to be slowing down and occurring on increasingly regional (rather than global) terms. Christophe Bull explores how technological developments create political challenges in the newest frontier in international security: artificial intelligence. Where self-learning AI technology becomes alarming in terms of real-life security implications is the possibility that it may facilitate cyber attacks. These attacks could cause financial harm, loss of life, and a violation of national sovereignty. They could also be interpreted as hostile actions and prompt an active response from states, triggering conflict. 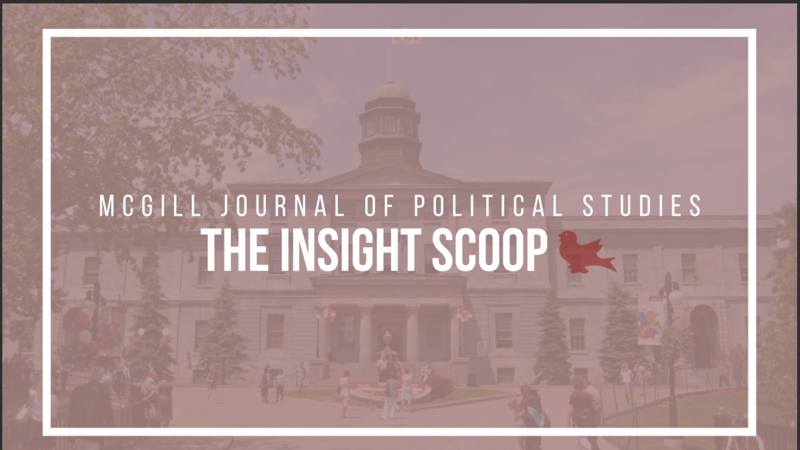 On the domestic side, Canadian Politics Editor Catharina O’Donnell goes West to talk to members of Alberta’s Yellow Vest movement and speculates that the right-wing resurgence in the province could be a boon to the provincial New Democrat Party. Embattled Premier Rachel Notley is up for re-election later this year. There are only 9 months left ’til the next federal election and this month Chanel MacDiarmid outlines the most important developments in our federal election outlook. A whirlwind January brought a Cabinet shuffle and by-election drama in Burnaby South. Next month, we welcome the return of the House and by-elections in York-Simcoe, Burnaby South, and Outremont. Follow us on Twitter, find us on Facebook, connect with us on LinkedIn, or email us to get in touch. Feature image via Flickr Creative Commons and made with Canva.